On Wednesday, December 11, 2013 prior to the Savannah Chatham County School Board meeting, Rev. 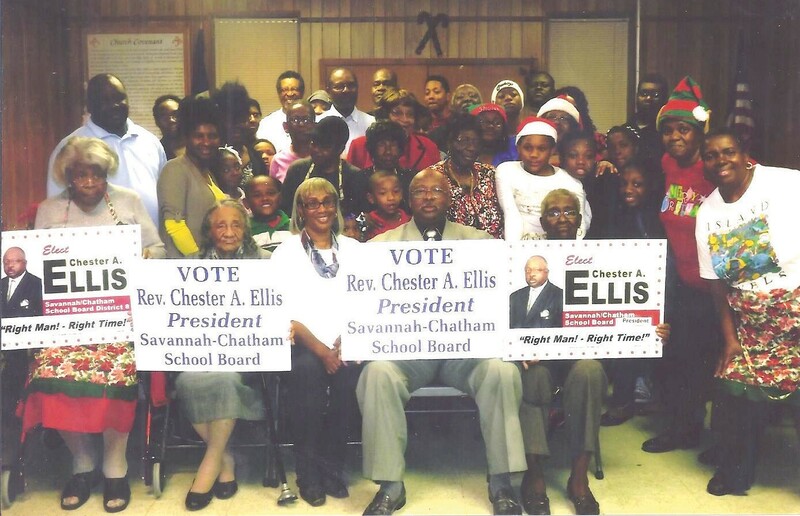 Chester A. Ellis announced his candidacy for the position of President of the Savannah Chatham County School Board. A follow-up kick-off celebration was also held on Saturday, December 14, 2013 at St. Paul Baptist Church. Rev. Ellis’ decision to run was an answer to the request of business, social, religious, civic and community leaders who felt that he has the passion, knowledge, dedication and determination to make our school system a model for the surrounding communities. Rev. Ellis is a lifelong resident of Savannah and a 1969 graduate of Sophronia M. Tompkins (now Woodville Tompkins) High School. He furthered his education at Savannah State College (now University) where he received a Bachelor of Science degree in Health and Physical Education. Rev. Ellis also has a Master’s degree in Education from Cambridge College and completed additional coursework toward a Doctoral degree in Educational Leadership and Change from Fielding Institute. Rev. Ellis was employed for 33 years by the Savannah Chatham County Board of Education working in both the middle and high schools. His accomplishments include: serving as the Building Leadership Chairman of Sol C. Johnson High School; having served as Chairman for the District Leadership Team; certified as a Teacher Support Specialist by the State of Georgia, a Mentor for Student Teachers, and a consultant for Cooperative Discipline Education; Head Boys Basketball and Track Coach of Jenkins High School and Cuyler Junior High School; Head Girls Basketball Coach of Sol C. Johnson High School; Physical Education Department Chair of Bartlett Middle School and Head Baseball Coach of Tompkins High School. In addition to his experience in the field of education, Rev. Ellis also has community related experience of being Pastor of the St. Paul Missionary Baptist Church and President of the Historic Carver Village Neighborhood Association; Corresponding Secretary of the Black Male High Blood Pressure Coalition, and Vice-President and President of the Beta Phi Lambda Chapter of Alpha Phi Alpha Fraternity, Inc.
Rev. Ellis’ vision for this school district is to assist in implementing policies and procedures that will help provide ALL students with the opportunity to become successful, productive citizens and compete on a local, national and global level.